The Magic Cafe Forums - Asked & Answered: What Is Cardistry? Many of the uses of a deck of playing cards are well known to everyone. After all, playing cards have been used for centuries in order to play card games, and perform card magic. But what exactly is this new kid on the block, that goes under the name "cardistry", is wearing out many an old deck, and is having brand new decks designed especially for its use? To whet your appetite, if you really do not know anything about cardistry at all, I would suggest that you start by checking out the following four-minute video clip. It already has more than 2 million views due to its popularity, and you will soon understand why when you see the cardistry highlights featured here. Cardistry can best be defined as "the performance art of card flourishing". It is what happens when you take traditional playing cards to the next level - literally! It is about spinning them, tossing them, cutting them, and otherwise manipulating them - up, down, sideways, and around, and however else you can - in order to create an aesthetically pleasing display. Cardistry does have a long history, because when card tricks became popular in the 19th century, magicians would often do simple card flourishes as a way of demonstrating their skills, to entertain, or to otherwise enhance a magic performance. It is true that many magicians are good at cardistry and card flourishing, simply because using cards is part of their job, and so they like to play with cards in new and interesting ways. However true cardistry on its own is not magic, and does not involve any magical manipulation or sleight of hand, but is rather a display of skill. The word "cardistry" is a combination of the words "card" and "artistry". So it is an activity that is about sheer skill and manual dexterity, in which a performer tries to create a beautiful display through the movement of individual playing cards or an entire deck. Cardistry takes an ordinary object that we are all familiar with - a deck of playing cards - and turns it into an art-form, by doing unfamiliar things with it. You could describe cardistry as the next step in the evolution of playing cards, because their original purpose for playing games or performing magic has been completely dispensed with. Instead, they are used for a brand new and interesting dexterity game of their own, without the strict rules and boundaries we are used to. And that is how it becomes a performance art, because this activity lends itself to creativity, and forces you to widen your usual perspective on a deck of cards, and do things with it that you previously have never even thought of, and things that you previously did not even think were possible! Some have referred to cardistry as card juggling, and that is an apt description, because cardistry is much like juggling, but with playing cards. Zach Mueller, who is a big name in this relatively new art-form, describes it as "kinda like yoyo tricks with cards." Cardistry is about doing things like fanning and cutting cards in a creative way and with a high level of skill, thereby turning it into a performance art. Instead of doing ordinary cuts and shuffles, expert cardists are able to do one-handed cuts, complicated shuffles, turnovers, tosses, and catches, in a way that is a beauty to watch. Cardistry moves typically have unusual names that reflect their creator, origin, or appearance. There is Kevin Ho's "Flurf", "Off the Hook", and "Racoon", Joey Burton's "Skater Cut", Huron Low's "Firefly" and "Flicker", Daren Yeow's "Rev 2 Twirl", Bone Ho's "Anaconda" and "Tornado Deck Split", Oliver Sogard's "Friffle", Dan Buck's "Vertigo", and many more. Chris Kenner's two-handed "Sybil Cut" flourish uses multiple packets of cards, and is a good example of a popular flourish. It is arguably the most well-known and recognized move among cardists, and is a common starting challenge that newbies to the art try to take on. But from there, there are all kinds of advanced maneuvers to learn, some almost being a sub-genre of their own, such as "isolations". In the last few years, cardistry has enjoyed a huge boom. What was formerly described as "card flourishing", and considered to be an activity used as a filler in a magic performance, has now become its own separate art form. Creative and skilled performers are performing moves of increased complexity. And yet anyone can give it a try, because the ingredients are simple: as long as you have a good deck of cards, you are ready to go, you can do it anywhere, and you are limited only by your imagination, creativity, and manual dexterity. As testimony of how big this new art-form is growing, you will find many performance videos and cardistry tutorials on the internet. Social media and sites like youtube and instagram have really helped popularize and advance the art, because cardists can share their new moves and tutorials and videos with other enthusiasts globally. 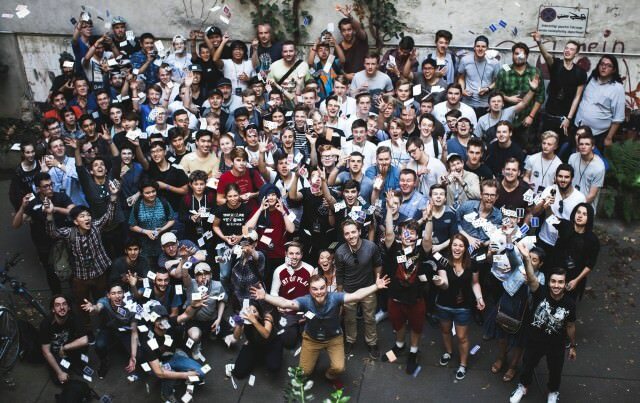 There are even international gatherings of top performers, and over the last few years, a Cardistry Con was organized as an international and annual convention for cardistry enthusiasts. The next event is planned for September 2018, and will be held in Hong Kong. Some of the big name attendees from around the world have included Dan and Dave Buck, creators of the biggest selling instructional DVDs on the subject, and a huge influence on the art; Zach Mueller, a viral video sensation, and creator of the popular Fontaine Playing Cards; and The Virts team from Singapore, makers of the Virtuoso deck, the world's first playing cards optimized for cardistry. As an indication of cardistry's popularity and appeal, Zach Mueller's Hypnotic Cardistry Kid collaboration video by Kuma Films has over two and a half million views. The follow-up California Cardistry video seems destined to crack the one million views mark as well. But with time, cardistry has continued to evolve, and with that comes the creation of new toys. Today the playing card market is full of custom decks that particularly lend themselves well to cardistry, and the last few years in particular have seen an explosion of new decks created specifically for this purpose. Since cardistry is all about creating a visual impact, creating a deck of playing cards that have carefully designed aesthetic qualities to maximize their visual appeal when fanning and spreading cards makes obvious sense. It is only a logical progression to create a deck with aesthetics that will visually accent every card flourish, from spins, to cuts, to pivots, to fans. A growing art form needs evolving materials, and that is what cardistry decks are all about. And there is a steadily growing throng of cardists around the world who are more than ready to support this growing market, by throwing money at projects that produce decks designed specifically for cardistry. As a result, we are seeing some beautiful decks of playing cards being produced, with stunning colour combinations, and striking visual designs. These decks are just a dream to use, and make even a basic flourish like a fan or spread look like a work of art. One of the best known examples of this is the series of Virtuoso Playing Cards created by The Virts, which is considered to be the world's first deck of playing cards specifically designed for cardistry. This deck has a real visual appeal when fanned and flourished, and many other cardistry decks followed suit. At the extreme end of this trend are the School of Cardistry decks from the New Deck Order. With these decks, playing cards have arrived a point they have not been before: 52 completely identical cards, front and back, designed purely for cardistry - and so further removed from the original purpose of a deck of traditional playing cards than ever before! But for the most part, cardistry decks still include traditional suits and values on all the cards, although their creativity and new purpose often makes them quite unsuitable for playing a card game or performing magic. Not only is cardistry a new art form, and not only are there many wonderful new decks of custom decks available that give it opportunity to really shine, but this new art form also has at its disposal new tools that allow this art form to grow in an unparalleled way. After all, we live in a digital age, and that means that the technology is there for people to produce high quality instructional and educational videos in the comfort of their own home. In addition, the global use of the internet and social media means that it is possible to easily share these videos with the rest of the world. All this means that at almost any other point of history, this new art form would be consigned to the fate of being unheard of, and at best experimented with by a select few. But in our modern age, cardistry enthusiasts can connect with and learn from each other, and share their expertise. While cardistry is a rewarding hobby even when performed in the privacy of your own home, cardistry will often be at its best when shown on film, with the benefit of slow motion video and accompanied by a suitable soundtrack. The progression and availability of technology means that high level and creative performances of card flourishing can be performed and filmed, and shared via the internet for the rest of us to enjoy and admire. A fine example is this stunning video from The Virts, which features one of the newer versions of their popular Virtuoso deck, and has already clocked up more than 2 million views. Because social media, shared videos, discussion forums, and other internet tools have played an important in growing cardistry, this also means that this young art form is very community focused. For the most part, the way that cardists connect and share is online. Social media platforms like Instagram and youtube, have played a key role in developing relationships and building friendships among cardists, and these provide ideal mechanisms to exchange ideas and learn from each other. The role of the community in the advancement of cardistry cannot be understated. The internet doesn't just help bring new cardists into the fold, but more importantly it helps ensure that the art form keeps exploring new territory. Because cardists are constantly coming up with new moves, it is by sharing these novelties that others in the community can then build on these further and take these new ideas in different directions. This ensures the ongoing evolution and maturing of this young art form in healthy and creative new ways. The fact that the actual number of people who enjoy cardistry in a particular location is usually quite small, makes it all the more important to connect with fellow enthusiasts over the internet. But while learning from videos posted by fellow cardists is one of the most important ways to advance your skills, there is nothing like meeting up and learning from another cardist in person. The annual international convention, Cardistry Con, is one way that physically brings together cardists from around the world. But cardists will often look for informal opportunities to do this and seek them out. So it is not at all uncommon to come across posts on internet forums from cardists who are travelling to another city, and looking to meet up with other cardists that they can "jam" with. Its vibrant community is one of cardistry's biggest strengths, and almost certainly guarantees that it will continue to grow in years to come. Here is a group shot of all the attendees from the 2016 convention in Berlin, Germany. But do not let the highly skilled performances you see of experts dampen your enthusiasm. Cardistry is an art form that remains well within the reach of beginners, because all you need to try it is a good deck of cards. From there you are limited only by your imagination, creativity, and manual dexterity. Certainly you can buy specialized decks of playing cards that particularly lend themselves well to cardistry. And if you would like to give cardistry a go, definitely consider picking up a deck like the Virtuoso deck, because it will automatically make some of your basic moves look amazing, and make the whole experience far more enjoyable, motivating you to stretch yourself and try new moves. But technology also means that there is also a wide range of excellent instructional materials that is readily available online. Using this material will give you a head-start in your new cardistry career. Begin by heading to the School of Cardistry channel on youtube, which was started in 2013 by cardistry team New Deck Order. This channel currently has almost 100,000 subscribers, and millions of views. While there is no shortage of cardistry tutorials online, some are very poor quality, and in contrast The School of Cardistry has been professionally produced. It was designed to function as a centralized and structured platform for complete beginners to pick up the wonderful art of cardistry, as its own mission statement describes it: "School of Cardistry is the best free Cardistry resource for absolute beginners. Tutorials for each card flourish are kept short, and include easy-to-follow verbal instructions." For those new to cardistry, the School of Cardistry is a fantastic place to start, and will give you the ability to start with the basics, and naturally progress to more advanced moves. Their progressive system of learning ensures a systematic approach in which you can build up skills, with the benefit of videos that are short and yet have clear instructions. If you are serious about learning some cardistry, head to the fantastic Resource and Beginner's Guide that was created by cardistry enthusiasts on Reddit. Want to give cardistry a whirl - literally? Why not treat yourself to a nice cardistry deck from PlayingCardDecks, and give cardistry a go for yourself? The Virtuoso FW17 deck created by The Virts is an ideal place to start, but you will find many other creative and colourful decks that are ideal for cardistry by checking the range at PlayingCardDecks here. Want to check out some more cardistry videos? Here are a couple of videos that are compilations of short clips posted by cardists around the world on Instagram, and feature some mind-blowing moves: Best Cardistry Compilation 2017 Video #2 and Video #3.